Yellow pond lilies growing in a pond on Calvert Island. Photos by Ian Cruickshank (right), Kelly Fretwell (top left), Stuart Higgs (middle left), and Maria Shallard (bottom left). 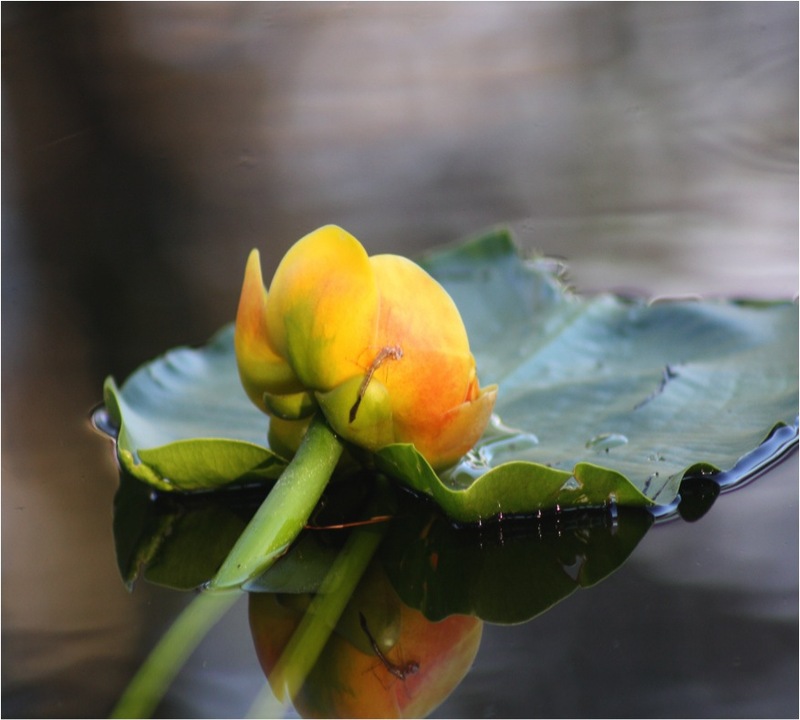 Yellow pond-lily is a perennial aquatic plant that grows from a large, 'prehistoric-looking' rhizome that can get up to 15 cm wide and 5 m long. 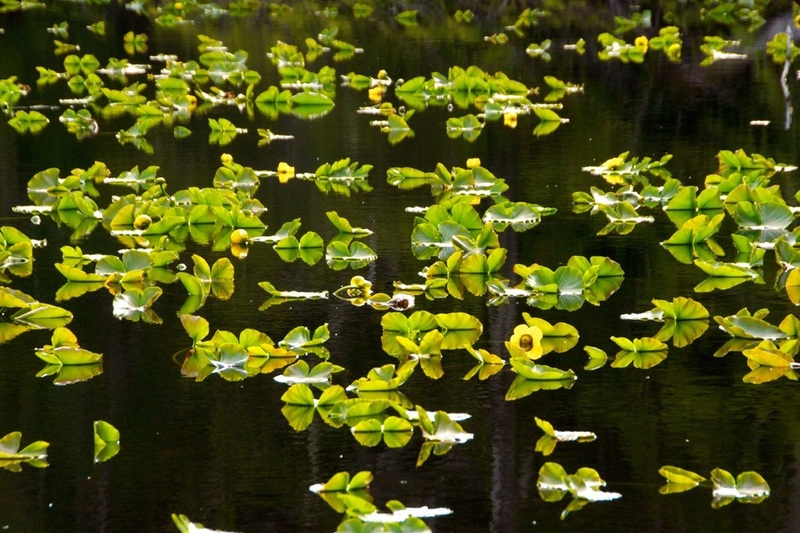 The flowers and leaves are the most visible parts of the plant as they float on the surface of the water, attached to long, thick, partially submerged stems. The bright yellow flowers may be tinged with red or green. These flowers are waxy, cup-shaped, and up to 10 cm across. The large yellow 'petals' that are most evident are actually sepals (outer modified leaves). These sepals are much larger than the 10-20 inner flower petals, which appear in a clump in the middle of the sepals and are surrounded by a circle of reddish-purple stamens. Nestled in the ring of petals is a single knob-like stigma. Click here to examine these parts in a close-up of the flower. The leaves, visible as they float on the surface, are 10-45 cm long, leathery, and shaped like an egg or an elongated heart. Yellow pond-lily grows in fairly shallow, still, aquatic habitats, such as ponds, shallow lakes, and slow-moving streams. It is found from low to middle elevations, and its range stretches along the coast north to Alaska, south to California, and inland into Colorado, South Dakota, the Yukon Territory, and the Northwest Territories. 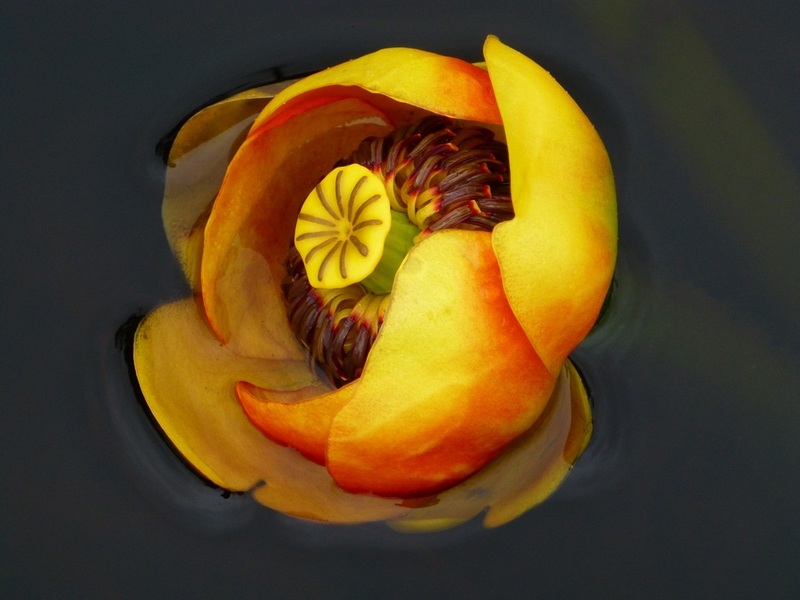 There are two species (sometimes described as subspecies) of yellow pond-lily: Nuphar variegata and Nuphar polysepala. The latter is pictured above. The most obvious way to tell the two apart is the colour of the stamens: on N. variegata (or N. lutea subsp. variegata) they are yellow, and on N. polysepala they are reddish-purple. Of the two subspecies, N. polysepala is most common in BC and is the one found on the Central Coast. N. variegata is found in eastern BC, and more eastern areas of North America. 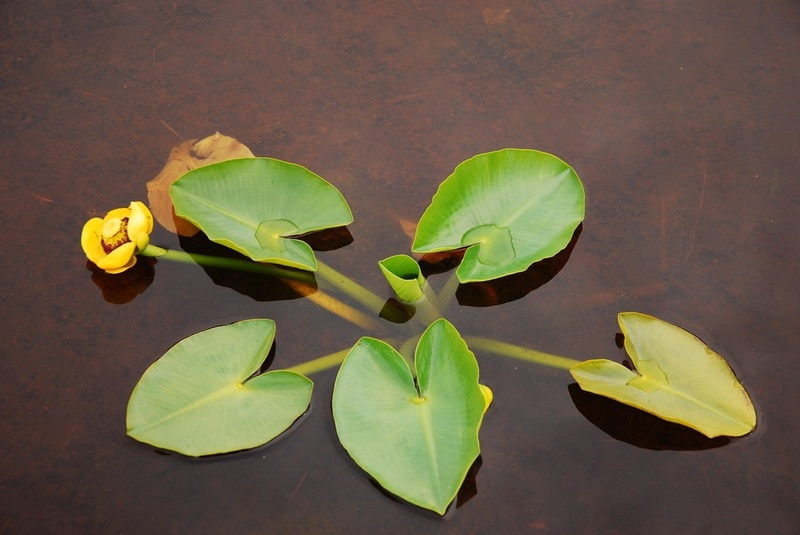 The rootstock and rhizomes of yellow pond-lily have traditional medicinal uses in many First Nations cultures. For example, the Nuxalk used the rhizomes to treat tuberculosis, rheumatism, heart disease, and gonorrhea, as well as in a blood tonic. The Haida used the root to treat colds, tuberculosis, ulcers, rheumatism, heart issues, chest and other internal pains, and cancer. Nuphar polysepala Engelm (Engelm.) E.O. Beal. In Klinkenberg, Brian. (Ed.). E-Flora BC: Electronic Atlas of the Plants of British Columbia. Lab for Advanced Spatial Analysis, Department of Geography, University of British Columbia, Vancouver. Accessed 14/08/2013. Pojar, J. and MacKinnon, A. (1994). Plants of Coastal British Columbia. Vancouver, BC: Lone Pine Publishing. P. 349.